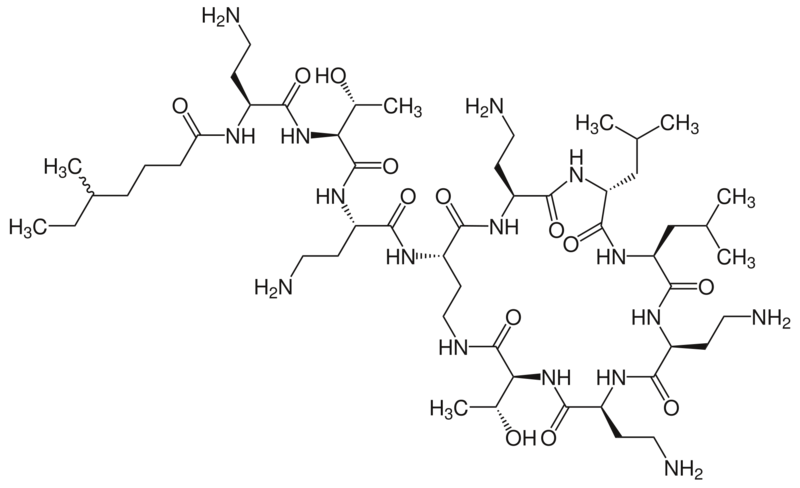 Many Gram-negative bacteria are inherently resistant to colistin, due to low negative charge in the outer membrane, which does not allow the positively charged colistin molecule to bind. Examples include Serratia, Brucella and Burkholderia species. It seems that modification of the mcrB gene is the most common type of colistin resistance, with several different modifications / disruptions being reported including: insertions of different types of mobile elements, point mutations, and small intragenic deletions.6 But mutations in mgrB explain only part of the story; in one study of 66 colistin-resistant K. pneumoniae, disruption of mgrB explained colistin resistance in only 53% of the isolates.6 So, we still have much to learn about the mechanism of colistin resistance! Ah YM, Kim AJ, Lee JY. Colistin resistance in Klebsiella pneumoniae. International journal of antimicrobial agents 2014; 44: 8-15. Jayol A, Poirel L, Villegas MV, Nordmann P. Modulation of mgrB gene expression as a source of colistin resistance in Klebsiella oxytoca. International journal of antimicrobial agents 2015; 46: 108-10. Poirel L, Jayol A, Bontron S et al. The mgrB gene as a key target for acquired resistance to colistin in Klebsiella pneumoniae. The Journal of antimicrobial chemotherapy 2015; 70: 75-80. Formosa C, Herold M, Vidaillac C, Duval RE, Dague E. Unravelling of a mechanism of resistance to colistin in Klebsiella pneumoniae using atomic force microscopy. The Journal of antimicrobial chemotherapy 2015; 70: 2261-70. Olaitan AO, Diene SM, Kempf M et al. Worldwide emergence of colistin resistance in Klebsiella pneumoniae from healthy humans and patients in Lao PDR, Thailand, Israel, Nigeria and France owing to inactivation of the PhoP/PhoQ regulator mgrB: an epidemiological and molecular study. International journal of antimicrobial agents 2014; 44: 500-7. Cannatelli A, Giani T, D’Andrea MM et al. MgrB inactivation is a common mechanism of colistin resistance in KPC-producing Klebsiella pneumoniae of clinical origin. Antimicrobial agents and chemotherapy 2014; 58: 5696-703. Cannatelli A, D’Andrea MM, Giani T et al. In vivo emergence of colistin resistance in Klebsiella pneumoniae producing KPC-type carbapenemases mediated by insertional inactivation of the PhoQ/PhoP mgrB regulator. Antimicrobial agents and chemotherapy 2013; 57: 5521-6. Liu Y-Y, Wang Y, Walsh TR et al. Emergence of plasmid-mediated colistin resistance mechanism MCR-1 in animals and human beings in China: a microbiological and molecular biological study. The Lancet Infectious Diseases 2015; doi 10.1016/S1473-3099(15)00424-7. ← Antibiotic surgical prophylaxis: stewardship’s ‘elephant in the room’? Interesting Jon, I look forward to learning more about this. Of particular interest will be any information specific to the development of Colistin resistance to Acinetobacter as this is often a reason why Colistin is used. Hi Pete this post was all about Enterobacteriaceae. There should probably be an entirely separate post about the non-fermenters such as Acinetobacter! sorry missed that! Yes good suggestion.